This takes a couple of days to from its festive flavours, but it's worth the wait. 1. In a large jug, mix together the cognac, sherry, water, bitters and absinthe. Add a black cherry to a clean bottle, pour the cocktail into the bottle and label. 2. Keep refrigerated and leave to rest for at least two days, or wrap as a gift. 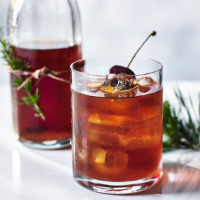 To serve, pour over a large block of ice in a rocks glass and garnish with a black cherry.